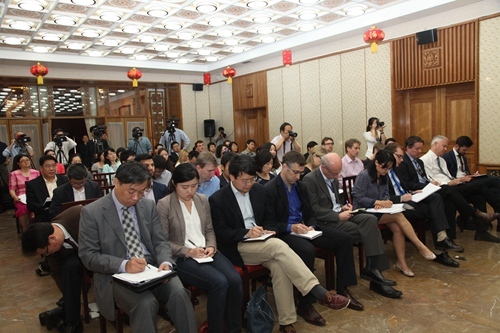 Welcome to the Chinese Embassy for the press conference. 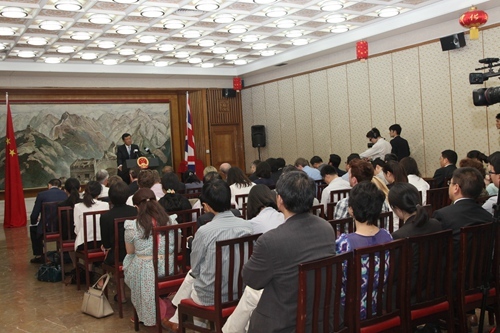 I am sure you have already heard about the upcoming visit by Premier Li Keqiang between 16 and 19 June at the invitation of Prime Minister David Cameron. l it is the first visit by Premier Li since he took office. l Advancing sound and steady bilateral relations on a higher level. In this context, this visit is a priority for both China and the UK. The expectations are high and the amount of preparation work enormous. Now we are in between the “ready” and “set” positions, on hair trigger for a “go”. According to the program as it is, Premier Li will meet Her Majesty The Queen. l attend the China-UK Global Economic Round-table. l Address a business gala and the China-UK Financial Forum. The first highlight is the interactions at the top level. l The Premier and the Prime Minister will have 5 hours of extensive and intensive talks between them. l In addition to the official functions, Premier Li and his wife will also have tête-à-tête interactions with the Camerons. I believe, these arrangements will help to build up trust and consolidate close working and personal relations at the highest level. The second highlight is the visit’s outcomes. Among the many possible achievements are over 40 agreements between the governments and businesses covering a wide variety of sectors including energy, investment, cultural and educational cooperation. The total value may be a record-setting $30 billion or even more. In addition to the Summit, Premier Li will be joined by the Prime Minister or leading British cabinet ministers at business and financial events. Their presence at the events will be convincing displays of our shared commitment to China-UK cooperation and the promise of a bright future. l The People’s Bank of China. And over 200 Chinese business leaders too will be in the UK for the visit, the likes of which has never been seen before. Their engagement with their local counterparts will give rise to new and bigger opportunities for both sides. And here I come to the third highlight, which is the breadth of issues to be covered by this visit. In their talks, the Premier and the Prime Minister will have an in-depth exchange on a broad range of international and regional issues. Their discussions will help to consolidate the two countries’ consensus and build on existing cooperation on issues such as world peace and security, common development and global challenges. l Reinforcing global economic and financial cooperation. It will boost confidence in the outlook of the global economy. 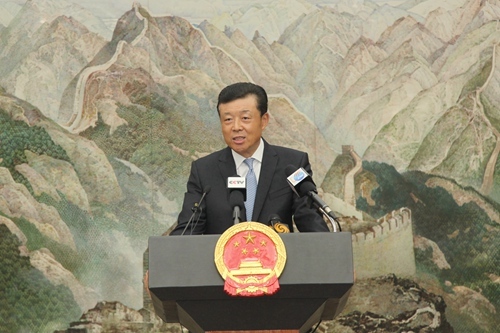 l Stepping up cooperation on China’s free-trade-zone initiative. Through the speech Premier Li will deliver to over 300 members and audience of two top British think-tanks, he will elaborate on China’s development and the better place our world is and will be as a result. I believe his insights, shared here in the UK, will greatly improve the understanding of China in Britain, in Europe and beyond. To sum up, this upcoming visit by Premier Li is expected to make a strong case for deepening China-UK relations and cooperation. l Consolidate the popular and social pillar of the partnership with fresh initiatives on cultural, educational and media cooperation and measures to further facilitate travelling between the two countries. With that I am wrapping up, and I am happy to take your questions.